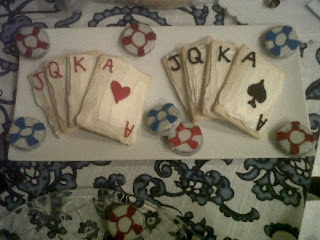 My friend recommended that I add a post about some cute snacks we made for our husbands' poker night a few months ago (back before I started blogging). As I was searching for the pictures, I ran across a few other cute pics of creative food things I've made and thought I would share them all in one post. First, snacks from Poker Night. I apologize for the poor picture quality; these next two pictures were taken with a cell phone camera. The cards are PopTarts with icing. The poker chips are Oreos coated in white dessert topping with icing piped on. They would have been even easier if we had been able to find White Fudge Oreos at the time. We also made our boys some pool ball cupcakes for Poker Night. 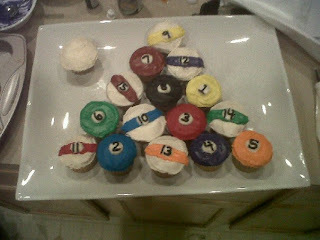 Okay, we know they don't have anything to do with poker, but they seemed appropriate for a guys' night. Besides, we had found the idea in a book a while before and had been wanting an excuse to try it. We actually looked up the proper colors and numbers for each ball on the internet. Do we need a life or what?! We didn't really follow the book's directions, which included using colored sugar and candies; we just used colored icing for everything. I think they turned out well, and apparently the boys did, too. They were all gone rather quickly. Next is something I made for my college graduation. 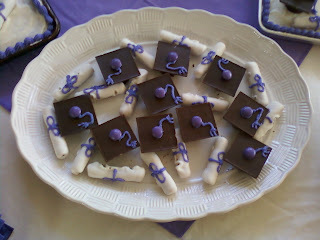 Little edible graduation caps and diplomas! The caps consist of a miniature Reese's cup with a square of Ghirardelli chocolate, topped with an M&M and an icing tassel. 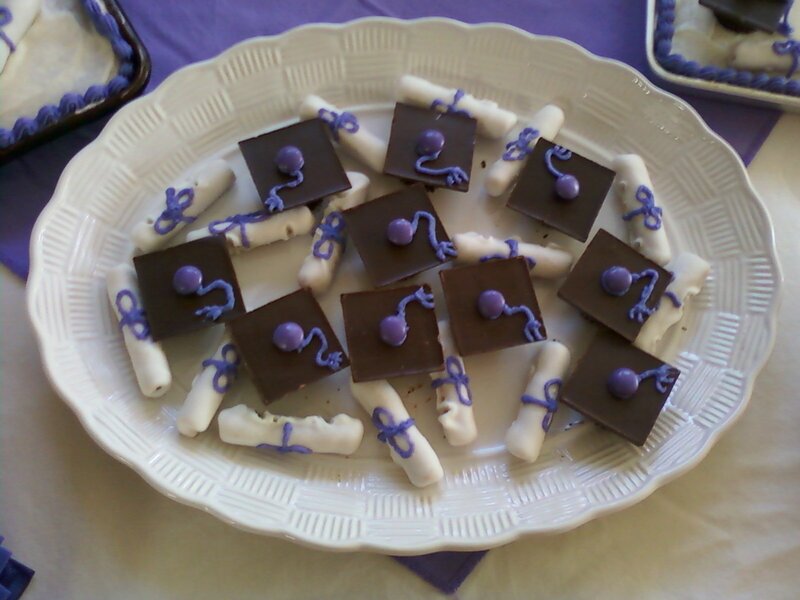 The diplomas are cookie straws coated in white candy coating. Big pretzel sticks would have worked, too. I also used them as cake toppers. Love how these turned out! And it's so easy to customize with different school colors. I lucked out and somehow found a whole package of purple M&Ms at my local Walmart--I was so glad to not have to go to a specialty candy store! Most people would probably be able to just find their school colors in any basic bag of M&Ms. Finally, I know this is completely out of season, but this project is so cute I just had to include it. Just tuck it away in the corner of your mind until next Thanksgiving. Or better yet, pin it on Pinterest and come back to it next fall. Cute, huh? 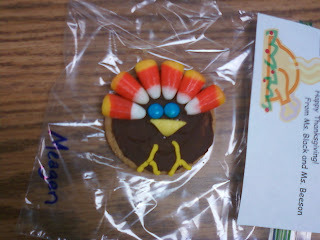 Sugar cookie with chocolate icing, mini M&Ms for eyes, corner of a Starburst for the beak, candy corn feathers, and icing feet. 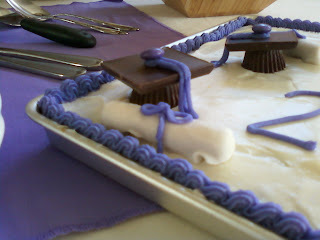 To make this even easier, you could use small Starbust corners for the feet, too, and not have to pipe any icing! 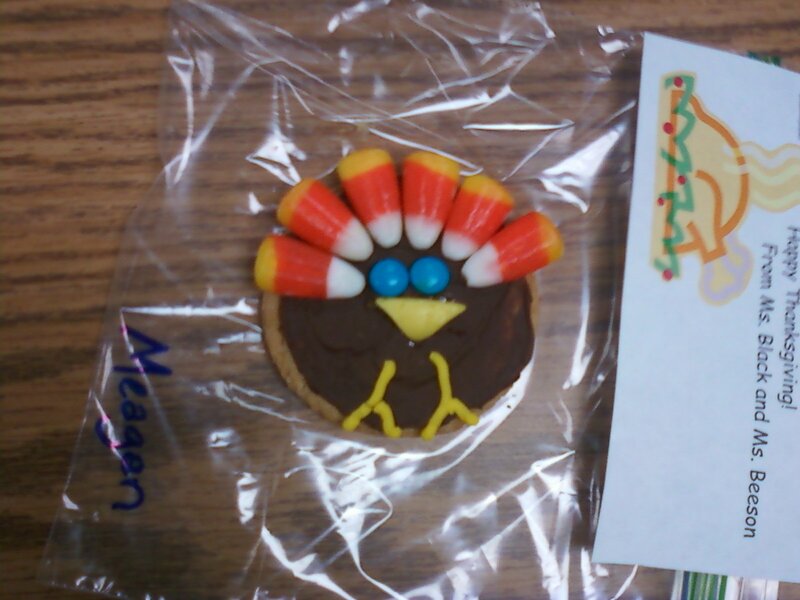 These are fun to make with kids.